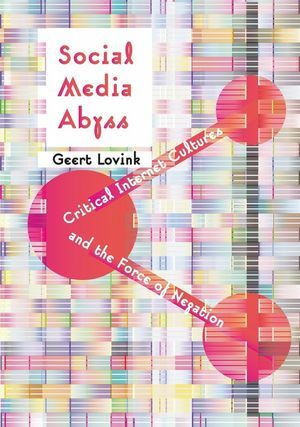 Geert Lovink strides into the frenzied social media debate with Social Media Abyss the fifth volume of his ongoing investigation into critical internet culture. He examines the symbiotic yet problematic relation between networks and social movements, and further develops the notion of organized networks. Lovink doesn’t just submit to the empty soul of 24/7 communication but rather provides the reader with radical alternatives. Selfie culture is one of many Lovink’s topics, along with the internet obsession of American writer Jonathan Franzen, the internet in Uganda, the aesthetics of Anonymous and an anatomy of the Bitcoin religion. Will monetization through cybercurrencies and crowdfunding contribute to a redistribution of wealth or further widen the gap between rich and poor? In this age of the free, how a revenue model of the 99% be collectively designed? Welcome back to the Social Question. English/UK edition (Polity Press) available from May 20, 2016. Order the book here.